I've seen manicures similar to this on several sites and thought it would be cute and fun to do...and it was. 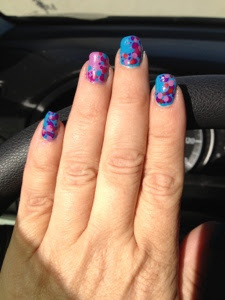 For this I used 5 Zoya shades: Robyn, Charisma, Perrie, Maura and Dana. 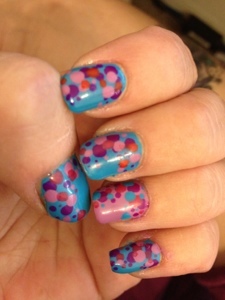 The blue base is Robyn and the accent nail is Perrie - all of the colors were used for the dots.